YETI Rambler Bottles go wherever there’s a need for ice cold or piping hot beverages. Which we think is just about anywhere. Their Over-the-Nose™ technology makes for easy loading, drinking, and cleaning. And their TripleHaul™ caps are 100% leak-proof and comfortable to grip. The 18 oz Rambler™ Bottle is a next-level insulated bottle. The perfect solution for your rough commutes, day hikes, or kayak sessions, this Rambler Bottle has the power to keep your water chilled or coffee hot until the last sip. We’ve also have YETI Rambler 20 oz. Tumblers— hurry in and grab yours today. Both the Rambler bottles and tumblers are a perfect gift idea for graduations, weddings, Mother’s and Dad’s Day. 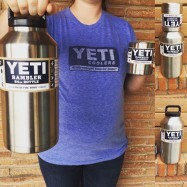 Stop in today at Argyle Feed & Hardware for all things YETI: YETI Rambler Tumblers, bottles, coolers, t-shirts, hats and more! This entry was posted on Sunday, April 17th, 2016 at 7:48 pm	and is filed under News & Updates. You can follow any responses to this entry through the RSS 2.0 feed. Both comments and pings are currently closed.